Happy release day to Monica Kulling for her extremely lovable new book, Merci Mister Dash! Wild child Daphne isn't the fastidious mixed breed pooch Mister Dash's favourite person. He'd much rather read the newspaper in the park than suffer a visit from his owner's niece. But naturally Daphne has less peaceful plans for Mister Dash. The story's warm, charming and full of chuckles and the illustrations are simply gorgeous. 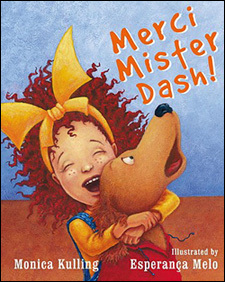 I pre-ordered a copy for my young niece and nephew and can't wait for them to discover Mister Dash!